When the defence has outnumbered you in the D. Look for upgrades in the situation! A passes to 1 or 2. The moment the ball is passed B & A can start. The other two couple in the D always join in! 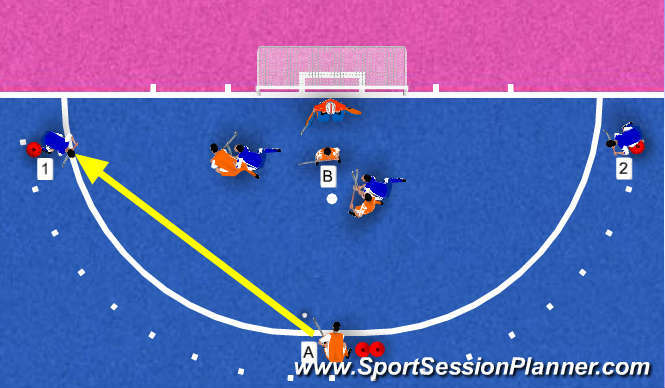 The 3vs4 is played untill the ball is in de goal, a foul is made or the ball is out of the D.
1. Manouver the defnders. Create space for eachother. 2. Give the ball possessor option to play the ball. Starting position of 1 and 2 to change the setting. B can start earlier or later!